The first is Kyle Busch Motorsports’ #46 Banfield Pet Hospital Toyota, last seen at Kentucky, as Busch, along with J.J. Yeley, are the only drivers attempting triple-duty. While Busch’s entry may seem to limit the list of possible winners, the latest of Busch’s four Truck Series wins at Bristol was actually back in 2013, and he didn’t run this race last year. Tonight also marks his last scheduled Truck start of the year. Harrison Burton will run Busch's #51 in his first start since a 15th at Eldora. Clay Greenfield looks to make his 3rd Truck Series start of 2017, his first since Gateway, in the #68 Titan Paint Sprayers Chevrolet. Greenfield has three Bristol starts to his credit, but none since 2013, when he ran 34th. His best finish at the track came back in 2010, when he drove Rick Ware’s truck to 16th. 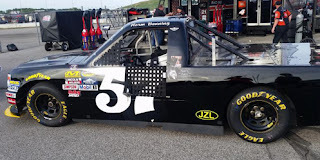 Parker Kligerman eyes his first Truck start since Kentucky as Charlie Henderson’s iconic #75 Food Country USA Toyota looks to make its first start since Caleb Holman’s last-place run at Eldora. Kligerman, who ran 20th in this race last year, was this race’s runner-up in 2012, following his Red Horse Racing teammate Timothy Peters to the checkered flag. After finishing 28th at Mid-Ohio in his first start for Joe Gibbs Racing, Regan Smith looks to run his first Truck Series start since Kentucky, once again in Ricky Benton’s #92 BTS Tire & Wheel Ford. Smith’s lone Truck start at Bristol came way back in 2007, when he ran 14th for David Dollar in the #47 Ginn Resorts Chevrolet. Last of the group is Jesse Little, who earned a pair of strong runs with JJL Motorsports with a 14th at Dover and 9th in Iowa. Little ran 17th in his lone Bristol start during this race last year. Defending USAC Silver Crown Champion Chris Windom is back in the Truck Series for the first time since he ran 19th in his series debut at Eldora. As at Eldora, he drives the #36 Chevrolet from the Mittler Brothers, though this time his sponsor is Baldwin Brothers. Joining Windom on the Mittler team is North Carolina short tracker Landon Huffman. Huffman has six CARS Late Model Stock Tour starts to his credit with a best finish of 5th twice at Hickory, and last year finished 16th in his ARCA debut at Berlin. Bristol will mark Huffman’s Truck Series debut. At the time the entry list was published, there was no driver listed for Beaver Motorsports, though Josh Reaume is now once again listed behind the wheel of the #50 Chevrolet. MDM Motorsports won the day at Michigan as Darrell Wallace, Jr. took the checkers in his first drive for Matthew Miller’s team. Driving the #99 Chevrolet this week is Brandon Jones, who nearly took the win himself in his last time in the truck at Kentucky. Jones, who will run double-duty along with a turn in the XFINITY race for Richard Childress, will on the Truck Side carry sponsorship from HTPG Refrigeration Products. On the LASTCAR side of the field, Mike Senica will drive Norm Benning’s #57 “start-and-park” truck for the third consecutive weekend. If the speed charts from those weeks are any indication, it will be a steep challenge for Senica to beat two other teams and make the grid. I see the 57 and the 68 DNQ'ing tonight. Like you said, the 57 is unlikely to make it out of last in qualifying, and the 33rd truck is somewhat up in the air. I would say either 6 or 10 would miss the show, but since they're probably locked in on owner points, Clay in a lot of ways gets screwed over. Also, J.J. Yeley is running triple duty, or at least attempting too. You are correct; I always forget Yeley is still running XFINITY.